I remember a few years ago when Red Rooster opened to much acclaim. I thought to myself, “I’ll never go there because it must be such a mob scene.” Fast forward two years to today, and, lo and behold, I finally made it to Red Rooster. And what an experience I had! I decided to take off from work today and, in step with my culinary aspirations, accordingly made a reservation at Red Rooster for 11:30 am, the only time they had available. My Dining Partner (MDP) and I trekked all the way up to 125th Street this morning, after a shocking 20-minute wait at our 7 train platform, to get to the restaurant. When we walked in, we were met with smiles. In general, the service at Red Rooster is extremely accommodating, and I felt that the moment I stepped foot in the place. We sat at a cozy table for two along a banquet that bifurcates the restaurant into a front and back area. In the front, there’s an interestingly shaped bar; in the back, a slew of tables. The restroom is plainly and straightforwardly marked with a sign near the open kitchen. To start, MDP and I ordered the cornbread with honey butter and tomato jam. You must get this. I think just about every table had a plate of cornbread on it because it’s that good and that cheap ($4). The honey butter tastes incredible and the cornbread itself is moist, dense and delicately ladled with kernels of corn throughout. 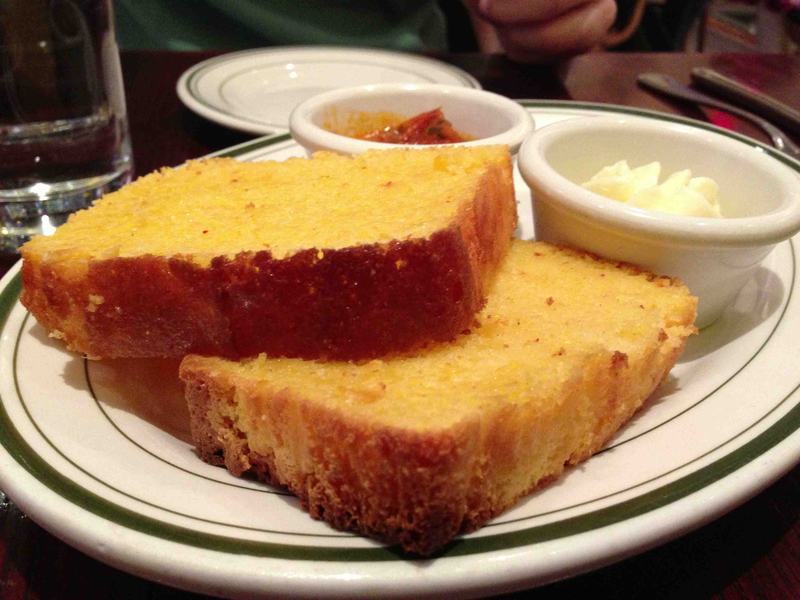 I enjoyed the tomato jam, as well, but, honestly, the cornbread tastes best on its own, without any adornments. Because I recently read that Red Rooster is using a Pat LaFrieda blend for its hamburger, I decided I had to try it. And, boy, am I glad I did! 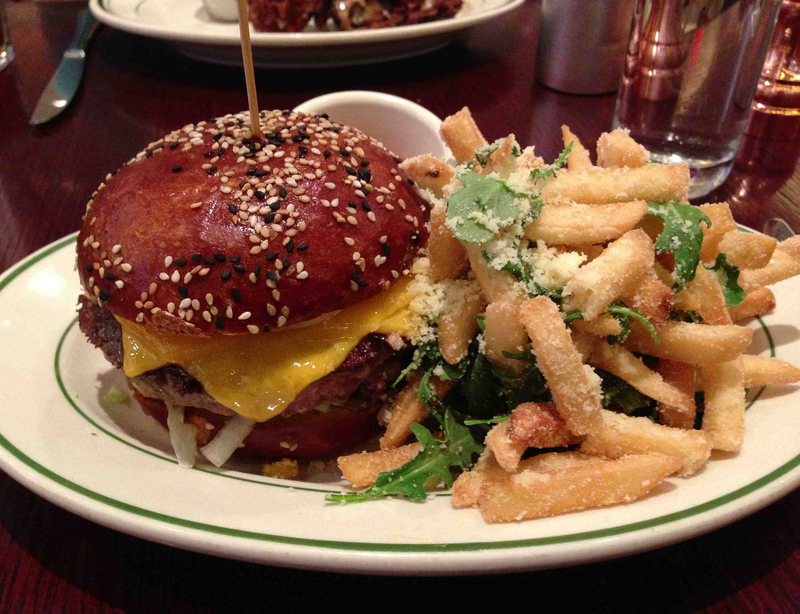 The burger is topped with two slices of New York cheddar, mayonnaise, shredded lettuce and pickles, and is situated nicely on a fresh pretzel bun. I liked that Red Rooster used two, rather than one, slices of cheddar–it enhanced the flavor tremendously. Also, the combination of condiments completely blew me away. This is one of the best burgers I’ve had in a long time. And, not to be outdone, the fries on the side were perfectly crisp and brushed with ample handfuls of parmesan cheese. I like that Red Rooster goes borderline overboard with the parmesan on the fries. Parmesan can be an elusive flavor, and I think Red Rooster’s approach is ideal. MDP ordered the fried yard bird with white mace gravy and buttermilk mashed potatoes. Red Rooster serves dark meat for its fried chicken, which MDP had no problem with. It was thickly crusted and flavorful. The mashed potatoes were delicious, as well. MDP enjoyed his meal, yet found the cornbread to be the overall highlight of his experience. And who can blame him? For dessert, we had to get something, because I knew this might be the only time I’d visit Red Rooster. When I searched for brunch reservations, they only had availability in about a month, and I’m not organized enough to plan that far ahead. So, dessert it was. They have a number of confections on their menu, including items from the Nook, such as whoopie pies. But we opted for the daily cupcake, which was a coconut cupcake today. 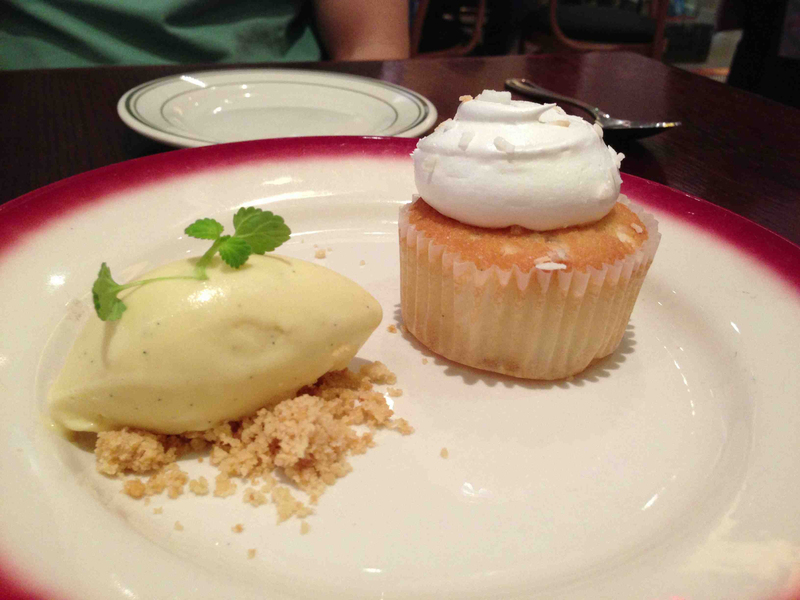 Served alongside some of the most delicious Tahitian vanilla ice cream I’ve ever had, the coconut cupcake was short and sweet, and had a bit of preserves in the center–a welcome surprise. We polished the plate off in no time. You must try Red Rooster. Anything you try there has got to be some of the best food you’ll ever have. Even if it takes months for you to get there, go. I implore you. Take the 2/3 to 125th Street. Walk north half a block. Join the Taylor’s Ham Tribe at Kumbuya!